Well, unlike my previous posts, where I was raving about plum blush, plum lipstick, etc. for winters. In this post I am breaking the trend and raving about a rather summary blush, at least the name "Cactus Flower" is very summary. Because, its a cream blush its perfect for me during winters when my skin is combination, as I have rather oily to very oily skin otherwise. Moreover, to me makeup is all about breaking oneself free and not follow any particular rules (there are no set rules for makeup). 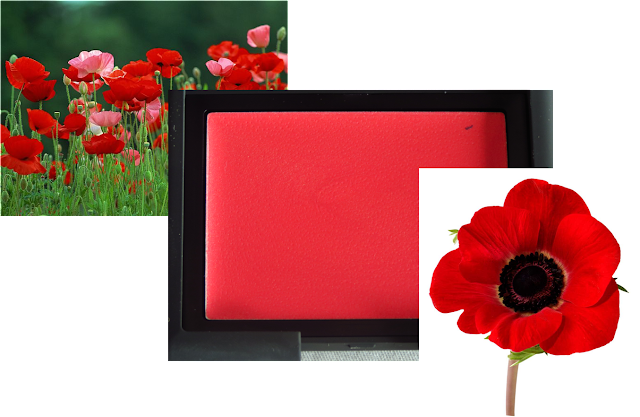 Coming to the topic now, Cactus Flower is a described by the company as Delicate Shimmering Poppy, which is quite perfect if you see the poppy flower's pictures alongside the product picture, below (flower pictures sourced from Google Images). The shade is a super bright reddish orange with loads of chunky gold shimmer (read fine glitter). The shade per say is very warm and perfect for summers as it gives you warm - sun kissed glow. The shimmer is quite chunky for my liking and it can be seen and clearly identified in the pan and even on your cheeks when the light/ sun hits the face. You can see the shimmer/ fine glitter in the pictures below (picture taken at night in artificial light to highlight the shimmer loaded in the blush). However, during winters when the sun is subdued, the shimmer in the blush gives a nice glow and doesn't look over the top. I find this blush quite festive and perfect for special occasions. The pigmentation of this blush is buildable and hence doesn't transform like a patch of blush on your cheeks and does not look as scary as it looks in the pan. You can control the intensity very easily. The consistency of this cream blush is creamy but powdery, if you can understand what I mean! It's not as creamy as MAC Blush Cremes or NYX's cream blushes, more creamier than MUFE cream blushes, but in pan form. Even though it's not VERY creamy, it's much easier to blend than MUFE cream blushes. It just blends without taking any extra effort. This being cream blush, it doesn't make my skin look shiny or oily, but, nice and healthy. In terms of longevity of wear, it wears extremely well. It did not fade on me for good 7.5 hours. After say about 9 hours it was slightly faded but still not completely worn out. I use my fingers to apply this blush as the brush picks up more shimmer/ glitter and make it look more chunky. Overall, I liked this blush, only thing is if they can make the shimmer a little bit more fine for those of you who can or want to wear cream blushes during summers. I will say it's worth the price considering its unique shade and longevity of wear. But if you do not like shimmery stuff, avoid this blush, it will disappoint you. If you are wondering, these picture were taken just before I got hair cut. I have some more posts for which I took pictures before the hair cut. I hope you all liked the blush and found the review helpful. Have you tried any of Nars Cream blushes, do let me know in the comments below. Have a nice and relaxed weekend. This is a beautiful shade! What are you wearing on your lips Eesha? it looks lovely! @ Ankita: Yeah its a lovely shade. I am wearing Revlon Color Burst in Peach and MAC Lychee Lux lipgloss. very lovely Eesha!!! loved ur lip color! Ooh :) love it on you.